The advantage and benefit of the TeraFlex JK 4" Elite LCG Suspension System for JK Wranglers is apparent the minute you put the pedal to the floor. With superior handling, responsive steering, ultimate off-road performance, and customizable suspension geometry, this system is miles ahead of anything else out there. TeraFlex continues to dominate the off-road market, and the Elite LCG reinforces that position. The Elite LCG Suspension can handle anything you can dish out. The Elite LCG Suspension System is the perfect solution for aggressive trail users looking for the most advanced Long FlexArm system available, striking a perfect balance of low center of gravity and ground clearance, while providing enormous performance gains. The Elite LCG features adjustable suspension tuning, and is accomplished through fully adjustable upper and lower long FlexArms that allow pinion, caster, anti-squat, and tire position configurations to be modified. 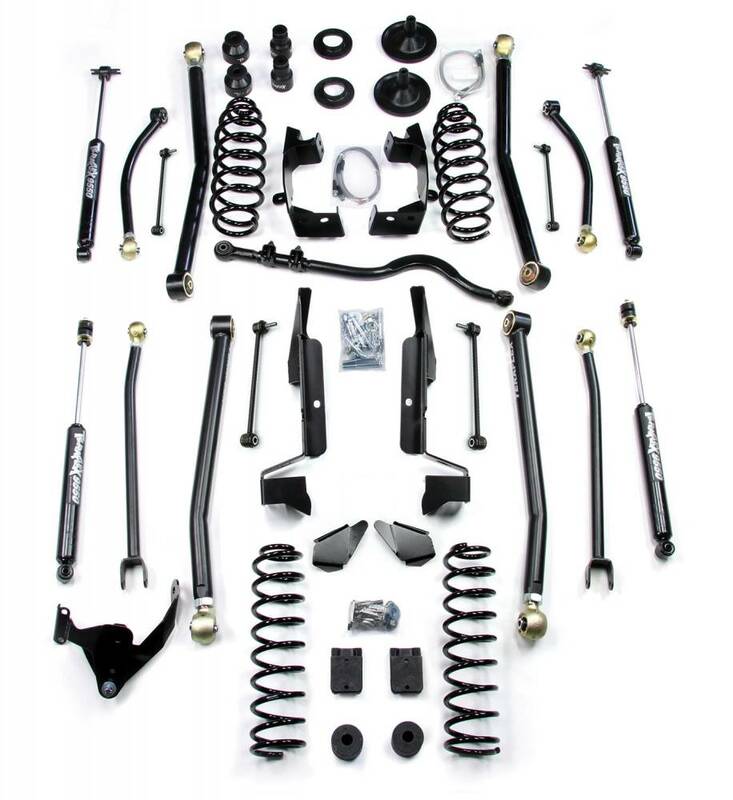 This kit includes 4" lift coil springs, 9550 VSS shock absorbers, front adjustable trackbar, weld-on long arm bracketry, long adjustable FlexArms, front adjustable monster trackbar, front swaybar disconnects, rear swaybar links, rear trackbar bracket, front & rear brake lines, bumpstops and all necessary hardware. This suspension system is designed to fit up to 37” tires (aftermarket wheels with 4.5” backspacing or less is required). Fits all JK Wrangler models including Rubicon & Unlimited. Note: Cutting & removal of factory bracketry and Welding is required for installation of this kit. Driveshaft modifications are recommended with this suspension system. 2012+ JKs require exhaust spacers (#2610000) or other exhaust modification for proper driveshaft clearance.